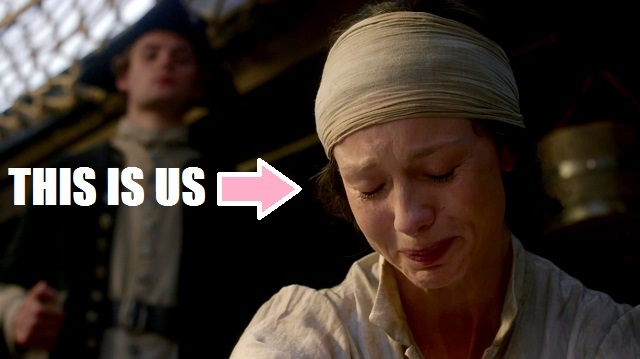 Thanksgiving is one day away and do you know what I’m thankful for, Outlander fans? 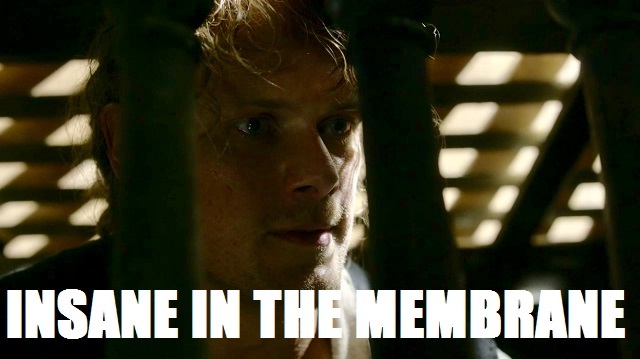 I’m thankful that I’m not on board the Artemis, the Porpoise, or any other vessel carrying Frasers. You know what else I’m thankful for? 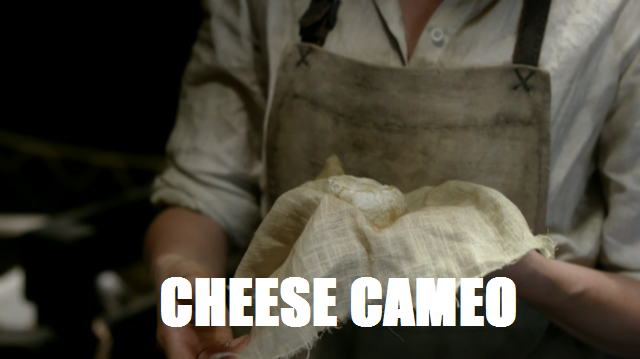 A new batch of material for Outlander Superlatives! Episode 310, “Heaven and Earth,” brought on the danger, desperation, and…dairy? Wait. That can’t be right. Nope. It definitely brought on the dairy too. So let’s all grab a raft and dive right in to the best of the best from this week’s episode! 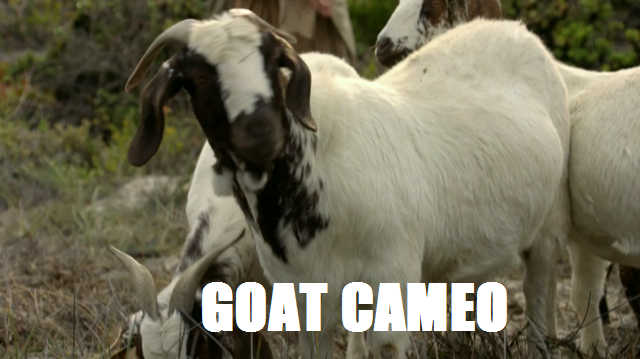 Let’s just make one thing clear: If there are goats in any situation, there’s a pretty good chance they’re going to be the MVPs. In this case, it’s their keeper, Annekje Johansen, who really makes the winning play, but she couldn’t do it without her four-legged sidekicks. 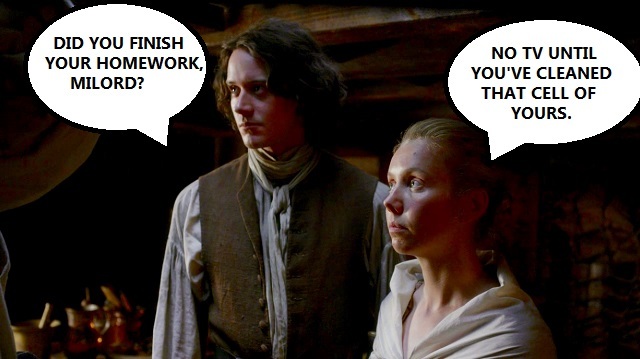 All Claire has to do is tell Annekje that Jamie is in trouble and that she needs to figure out a way to warn him, and Annekje is like, “My goats needs grass.”(Direct quote.) And sure, with such a vague yet oddly specific statement, I can’t say I blame Claire for being slow on the uptake, BUT WHAT SHE’S TRYING TO TELL YOU, CLAIRE, IS THAT SHE CAN HELP YOU ESCAPE. And when that plan fails (stupid Captain Leonard), Annekje convinces Claire to jump overboard with a raft. All that and she hands out free cheese. 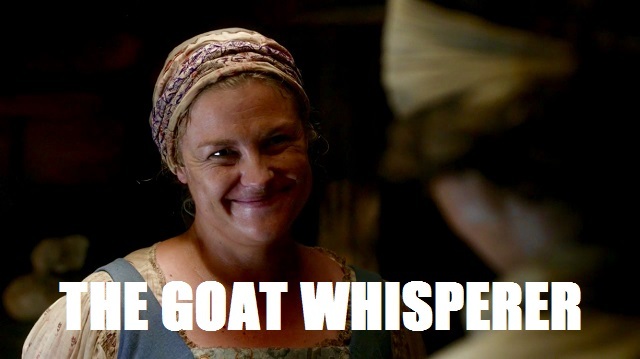 Goat Lady for the win. Are we sure the real name of this episode isn’t “NO! Not Mr. Pound!”? 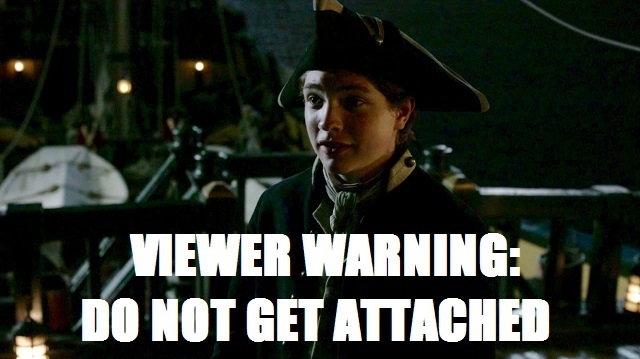 Of all the men on the ship, the last one to succumb to typhoid just has to be little Elias, doesn’t it? It can’t be that beastly cook or the guy who tried to kill Wee Ian. It has to be the orphan who tells everyone to treat Mrs. Fraser with respect and gives her his lucky rabbit’s foot and helps her out with literally everything. IT HAS TO BE HIM, right world? Sorry. I’m not as good at compartmentalizing as Claire is. 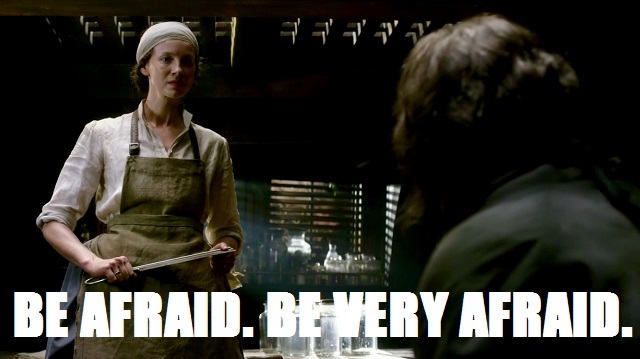 Claire is at her Claire-iest in this episode, tossing out orders, saving lives, yelling at that gross cook, and THREATENING THIS GUY WITH A CLEAVER. 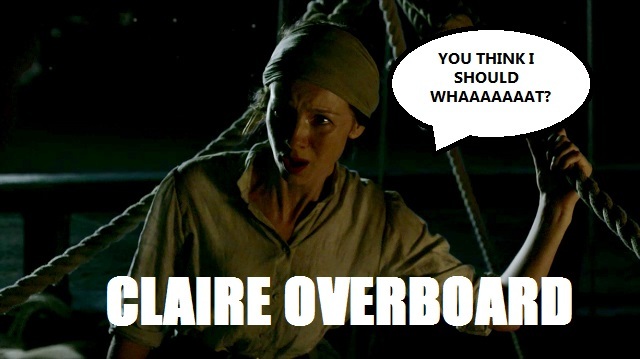 All of that is kind of par for the course with Claire, but jumping overboard in the middle of the ocean? That’s taking it to the next level. I could never do that, even if it meant saving the king of men…but I suppose once you’ve traveled back and forth two hundred years a few times, a high dive wouldn’t seem so scary. Also, can we have a moment of silence for Brianna’s poor blouse? That thing has seen better days. But I guess when your mom wears it 200 years into the past, you don’t really expect to get it back. James, you know I love you. You know I think you can do no wrong. But do NOT—I mean it, DO NOT—tell Fergus that he doesn’t know what real love is. HE LOST HIS HAND SAVING YOU. I get that when people are in desperate, life-or-death situations they say things they don’t mean, so I’ll allow it. 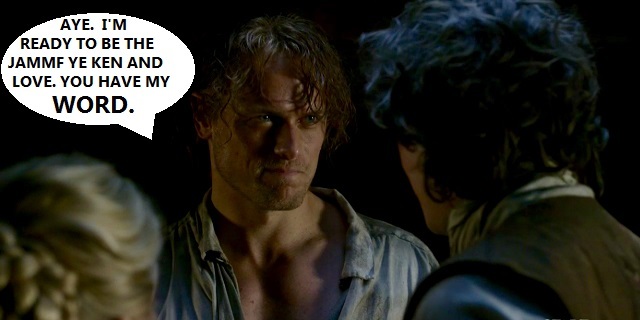 But watch yourself, JAMMF. 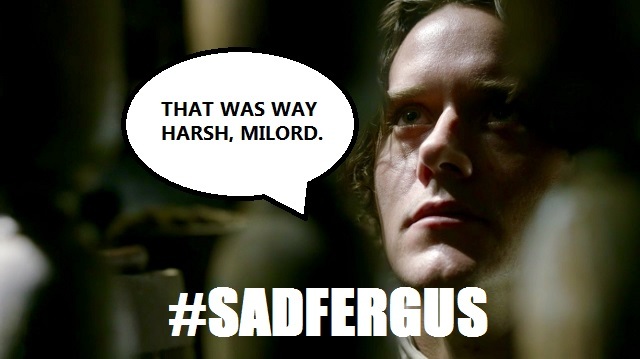 You don’t get to mess with Fergus. Fergus has been on quite an emotional journey. His little buddy has been kidnapped, he can’t get permission to marry the love of his life, and now milord is yelling at him from his jail cell. Can someone please give this guy a hug already? I said a hug, Marsali. A HUG. Can it be that she of the eye rolls and sass is the most level-headed person on the Artemis right now? 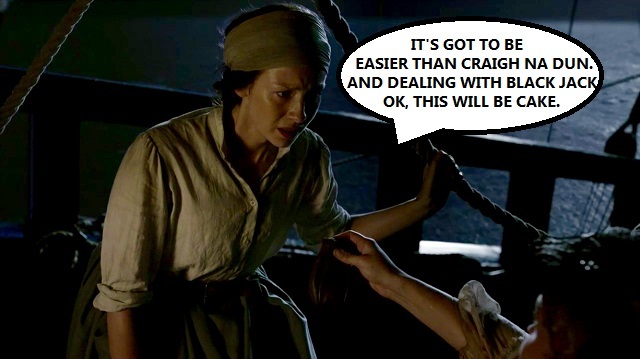 She assures Fergus that freeing Jamie and starting a mutiny would be the worst possible idea ever, and she gets Captain Grouchy Pants to let Jamie out of lock up. You’re a good apple, Marsali, and you sure fell far, far from the Laoghaire tree. Also, I kind of love seeing these crazy kids doing the parenting here, don’t you? Granting his blessing. 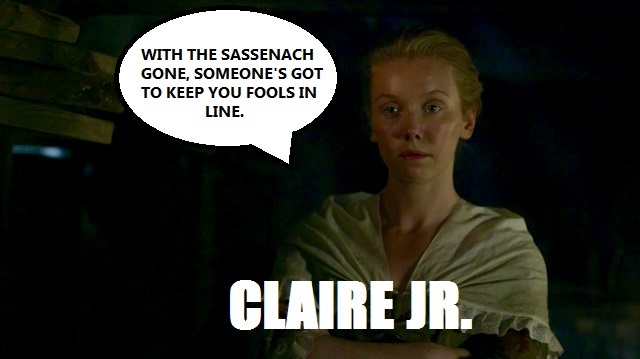 Calling Fergus “mon fils.” This is the JAMMF we need. Literally. I need this JAMMF in my life, like, constantly.